Every year when I was growing up my grandpa (Grampy) would call me up on the morning of April 1st. Each year the story was the same. He would say there was a moose in my back yard and that I should run out there to see it. As a young child I fell for this--probably multiple times, as April 1st doesn't come all that often. Eventually I recognized the pattern and refused to be made a fool, but that didn't prevent him from calling anyway, and we all still had a good laugh. A couple years ago I got him back. Good. 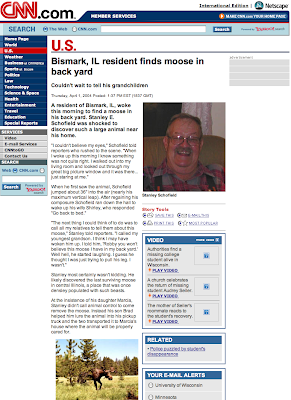 I copied the exact layout of a news item on CNN's website and replaced the text and images with my own news story about a Bismarck, IL resident (Grampy) who found a moose in his back yard. I emailed a link to my fabricated story (click here to view) to several family members. Everyone had a good chuckle. I wasn't expecting this, but everyone who received the link to the story thought it was so funny they started to forward it to their friends and extended relatives, nearly all of whom were unfamiliar with the running joke. I'd say a good 95% of those people believed it, and Grampy started getting phone calls and emails from people who saw his story on CNN. He was left with some explaining to do. While I can believe that Marcia would want to take care of the moose, I cannot believe that Grampy's vertical leap was 36". Well, maybe if he had a running start. Loved that story... have a good day, hugs, nan--PS, so does this mean , if I told you there was a MOOSE in our yard, you wouldn't believe it/? ?